Hey, I’m ready for another Show-and-Tell episode. I hate you. Because of you, I was unemployed for months. I just wasn’t in the mood for a Show-and-Tell episode. Oh! If only I had the same luxury of not being in the mood to make a living and survive. Sorry. Well, now you have a job again. Let’s get on with it. You make me feel bad. …Welcome to the fourth episode of Show-and-Tell! What do we have in front of us today? It’s a modest creation that I made on my roof! OK, what’s the deal? Why did you stop speaking again? Oh, I’m supposed to be saying something? Don’t tell me you forgot how to do this job. You’re supposed to ask questions about the picture! Oh…oh! OK, all right. So, why on the roof? Well, we had a lot of snow falling for the past couple of days, and the roof right outside the window in my room, of course, had a lot of snow as well. I thought to myself, “Whoa! I can play with snow without having to go out? !” With that silly thought, I got to work on this little scene. Lame-o?! What? Wait…I see you remember how to do your job again. Remember? What are you talking about? Oh, is that part of the job description? That was just me being me. Anyway, we obviously have a wintry scene here, yet we find all those scraps around the snowmen. Care to explain why you dumped the inside of your head onto this “creation”? That’s not my brain, if that’s what you’re trying to imply! They’re wood scraps that I saved from my Sociology project a few weeks ago. A pack rat, I see. Thanks for answering my question, loser. Why are there wood scraps on this scene? I felt like I needed to combine two quite opposite concepts—winter and spring. I wanted to show snowmen surrounded by wood, which represents spring and life. If you think of it in terms of spring, of course it does! Uh-huh. 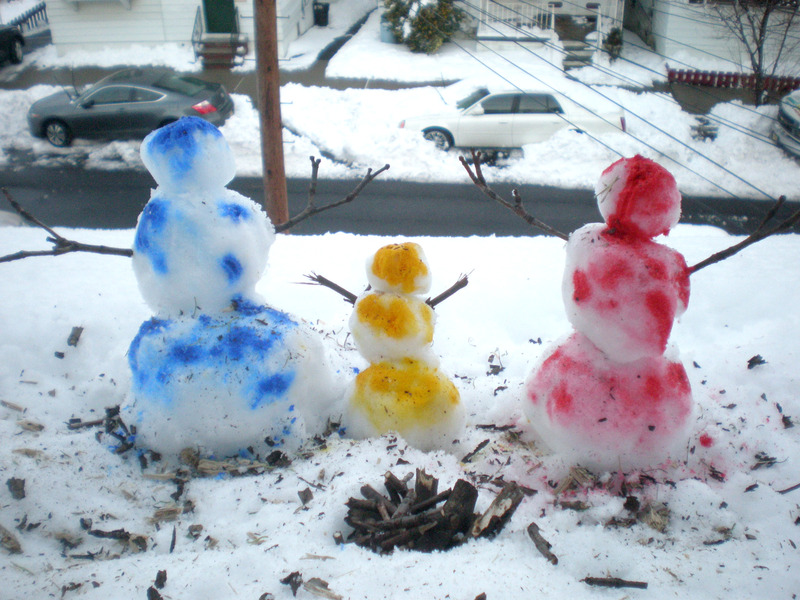 I’m going to assume that these three snowmen compose a family. So, why is mom all bloody? Not bloody. Just red. The three primary colors. Red is the three primary colors? You might want to rethink that statement. So, what do these colors “represent”? Life? Death? Innocence? I think the three colors symbolize child’s play, which I think this entire “creation” is. It’s a mere finger painting. See you next time! Hopefully not in five months. 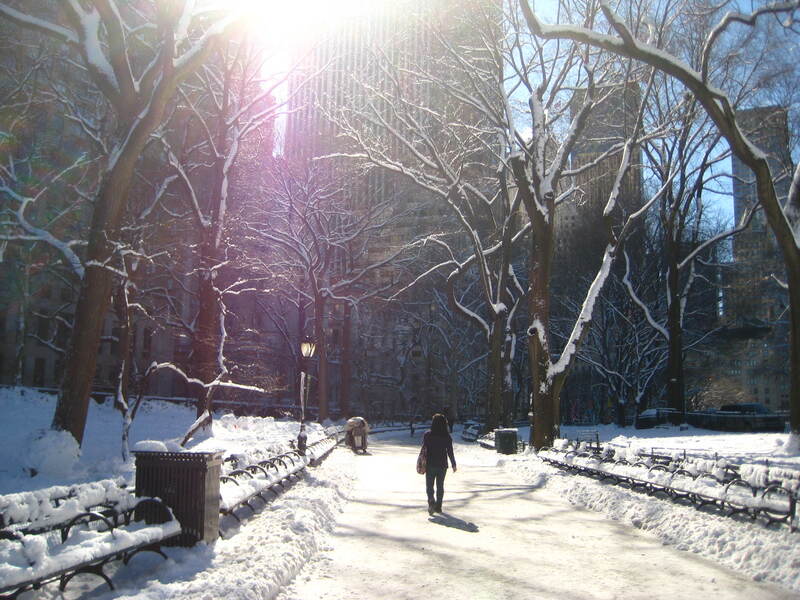 I hate to use that phrase, but it’s the only one I can use to describe Central Park after the snowstorm yesterday. It truly looked fantastic, and I had so much energy with my camera, snapping picture after picture. It might then be hard to believe that I was pretty much cranky the entire day. First of all, because of the snow, classes were canceled once again, so my parents decided to take me and my sisters to New York to tend to some passport business. It was a regular work day for them, so we had to wake up early. That made cranky Jeremy #1. Cranky Jeremy #2: We had to take photographs for the passport, but there were so many requirements for how we looked in the pictures, such as no bangs and ears must be visible. I was planning on getting a haircut later, but since I was already there, I had to crudely use some gel to get my hair out of my face. 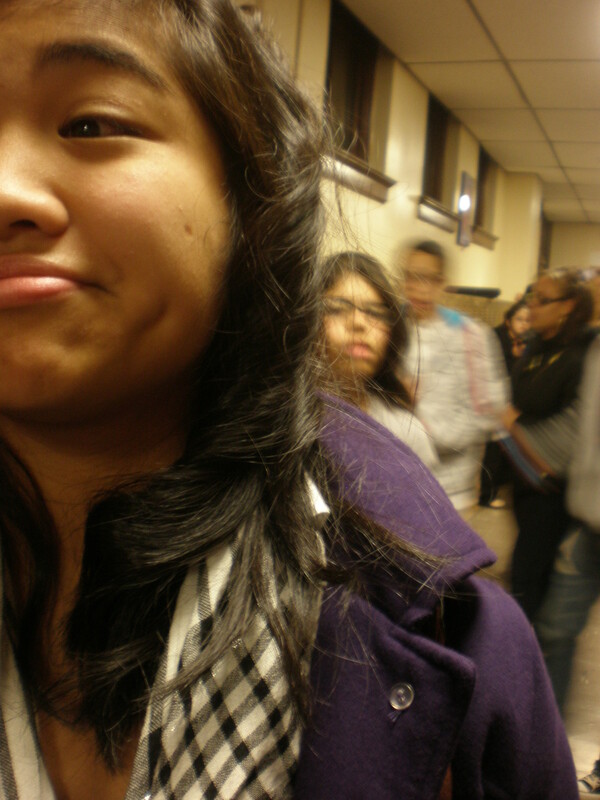 That was annoying because I looked terrible. Cranky Jeremy #3 came when we actually went to the Philippine Consulate to renew our passports. Although the waiting time wasn’t that long, I still got cranky just because I felt like I was on a roll. Afterwards, I convinced my sisters to walk about twenty streets to Central Park, which they both agreed to. There were more versions of cranky Jeremy afterwards, but there’s no point in describing them all. But I know that cranky Jeremy left for a while when he was in Central Park. OK, no more third person. Then, after spilling gravy all over the table for lunch, my mom accompanied me and my sisters to Chinatown, where I got my haircut and where we just roamed around for a while. Winter unleashes its fury with a snowstorm! Or blizzard. I don’t really know, but either way, the whole state pretty much anticipated it, prompting my school district to decide to close the schools yesterday. But thankfully, my friends were so intent on getting me out of the house that they walked several blocks just to pick me up. Of course, my parents couldn’t say no afterwards. So, we trekked back to Joe and Sarah’s neighborhood (they’re neighbors), where the huge hill was. Sledding was a fail. I don’t think today’s snow was meant for sledding. After several tries, I sort of just quit and proceeded to build a snowman. 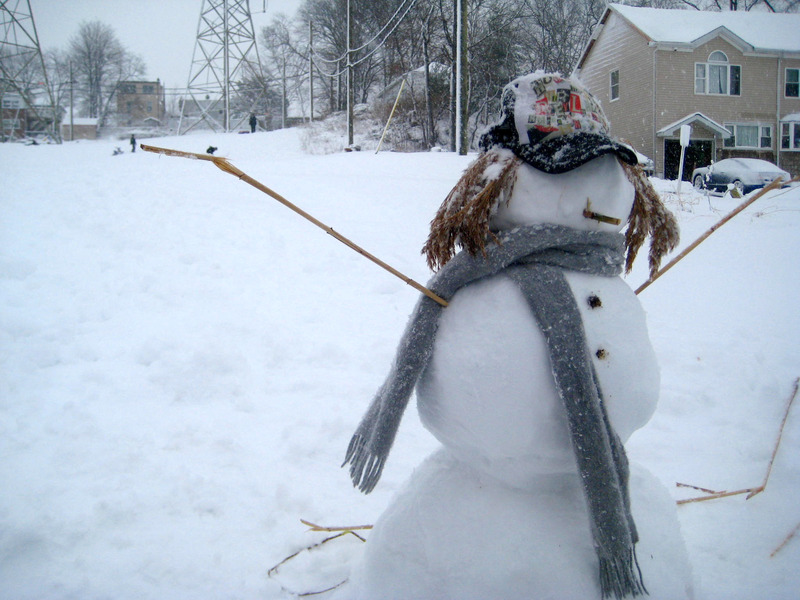 I’m pretty sure this is the first snowman I ever made. All the other times I tried, I failed. Rain. Rain. Rain. Winter fail. 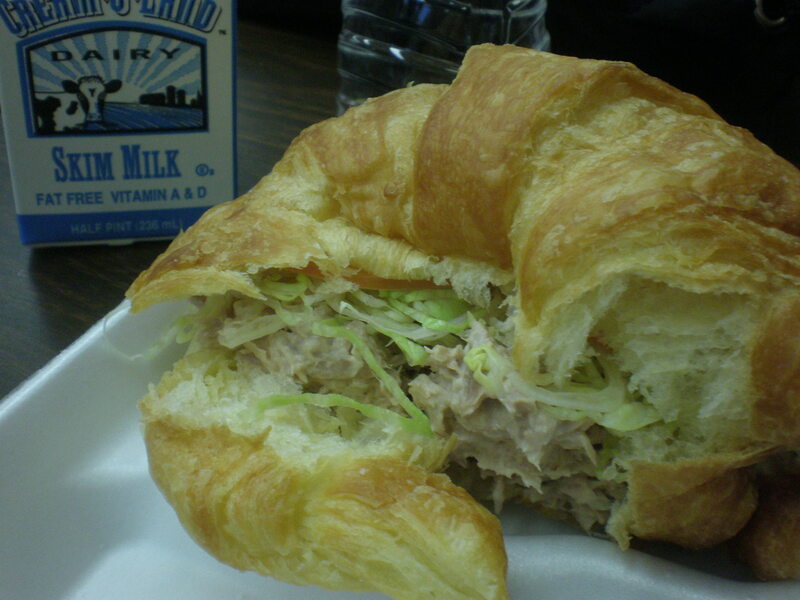 Typical of many school cafeterias, ours served mediocre lunches. Once in a while, I would actually buy lunch from our school, and, once in a while, when I would actually buy lunch, I would get a sandwich. The bread the school uses isn’t actually gourmet. Well, none of the food is, but I brought up an idea to the lunch ladies that would make my lunch a little better. As you’ve probably already seen, I used a croissant for my sandwich, as opposed to…regular bread. I asked them last week if I could bring in my own bread and if they would serve me using my croissant. They agreed, and I got a cheaper lunch. I just need it toasted next time. They really shouldn’t have the middle school winter concert right after the high school’s. Winter concert in school. Many of my friends were either in the choir, the orchestra, or the band. Some nice holiday music to get you in the mood. 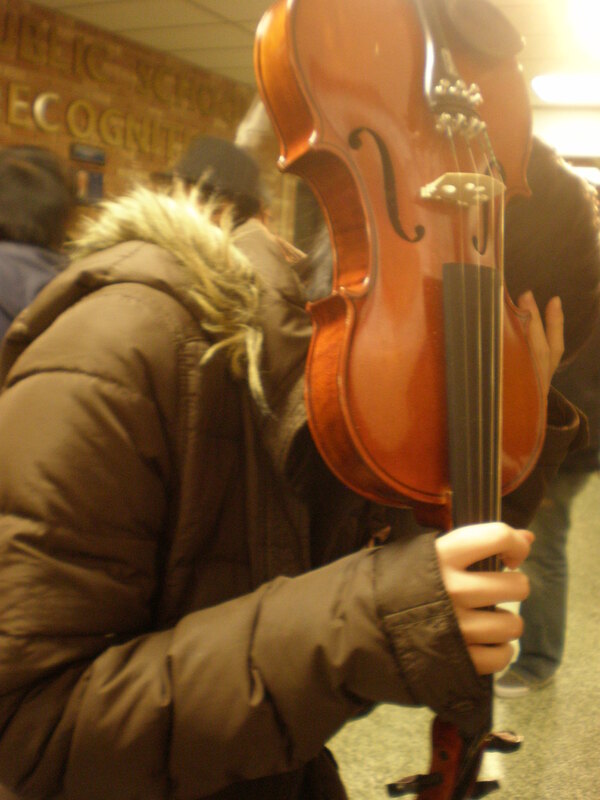 Bah, I really want to learn how to play the violin. I could’ve been a prodigy! You Call That a Nice Day? I’m so ready for the winter cold that I didn’t truly appreciate the warm weather today. Like, seriously, we were all playing tennis with one shirt on.